Mentoring is an excellent process for the career development of Extension Professionals. It is the process in which a more experienced and knowledgeable person provides support, feedback and guidance to a person who is less experienced or knowledgeable. Good mentors can help accelerate the professional development of the mentee and provide them with greater confidence and ability to tackle key tasks. The process is also rewarding for the mentor, who has the satisfaction of assisting others, just as they may have been assisted in the past. It also helps them review and reflect on themselves and their own networks, tools and processes. People can establish mentor relationships themselves and there are also organisations who run mentoring programs. The Australasian-Pacific Extension Network (APEN) is a professional organisation that provides information and support to those interested in extension. They have a mentoring program for people with an interest in extension. Through their program they match experienced mentors with mentees. 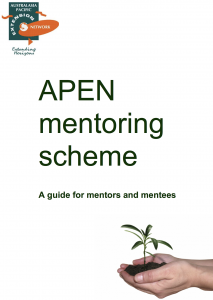 They have also produced a guide for mentors and mentees. They use a mentoring conversation approach (Rolfe, 2006) which is based on the Kolb Learning Cycle. This gives an action learning approach which is an excellent process for adults to learn within. 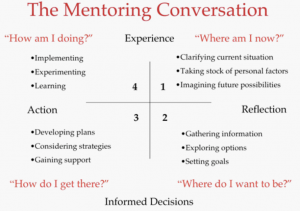 Through the Mentoring Conversation approach, the mentor helps the mentee understand where they are now and where they would like to be in the future. The Western Australian Natural Resource Management Program have produced a useful guide which they have used to support their mentoring program. Please click here to view the guide. Meat and Livestock Australia have a mentor program called “Leg Up“. Through the program ongoing mentor support is provided to people working in research, development and adoption in the red meat industry. The project has paired twenty industry entrants with twenty established industry professionals for a twelve month period. Dairy Australia have developed a mentoring program called DairySage Mentoring 2018. This is a six month structured approach, partnering experienced people with individuals from all dairy industry sectors. Information on the program can be found here and it has a handbook that can be viewed here. The Australian Rural Leadership Foundation has the objective of developing leaders for rural, regional and remote Australia. Their programs are accessed on that web page. Traditional – Expert with novice. Informal – Chance meetings and conversations. Formal – Part of a structured program. Reciprocal – Where two colleagues support each other. Reverse – Where a senior person is mentored by a person who is more junior. Group – One mentor works with more then one mentee. Mastermind – Peers operate as a group in a think-tank type approach. Mentoring Circles – A variation that combines elements of the mastermind and group approach. Manager mentors – Leading team learning with employees. Mentoring moments – Taking the time to have mentoring conversations. For more information read Ann’s article here. Ann has also provided a number of videos on her YouTube channel. 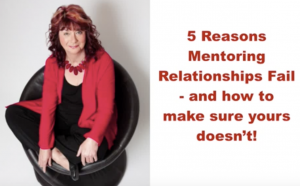 This video points out the key five reasons why mentoring may fail, five secrets of success and five key steps to take to set things up for a successful mentoring relationship. To view the video please click on the image below. There are a wide range of options to approaching mentoring. Take the time to reflect on what you would like to achieve in your career and how mentoring could help yourself, then consider taking some steps to getting some mentoring support. Also consider how you can better help support others.